Walking through the streets of Barcelona, how could I not see the containers of debris filled with these great Modernista hydraulic floors? I was amazed that anyone could throw these beauties away, then sad, mad which is probably what prompted me to act. I began dumpster diving for the tiles and bringing them home. I learned that these tiles were produced by applying colored powdered marble to a baseof concrete througha hydraulic process. 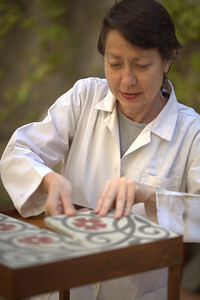 The tiles can be up to a hundred and twenty five years old and were a fundamental part of the Catalan Modernista movement which in many ways mirrored Art Nouveau. Antoni Gaudi is without doubt the Modernista's most famous practitioner and his still unfinished Sagrada Familia Cathedral is thestyle's finest example. I decided to start collecting these tiles which soon piled up quickly in our apartment. The idea was clear, I wasnot just going to hoard them but I was going to give them a second life by making tables, consoles, frames, trivets and related products. It was then that Mesa Bonita was born. I personally round up the tiles and chisel up to 3 inches of age hardened cement from the back of them by hand, restore the front and treat them to return to their original beauty. Then I oxidize or paint the frames (which are made for us by local artisans) and set and grout the tiles. All is handmade, that is for sure!